Your beauty is more than skin deep. The same is true of a diamond. Many important inner qualities contribute to a diamond’s unique allure, durability, and value. Let’s talk about how your diamond gets its distinctive personality. It takes the artistic eye and skilled hands of a diamond cutter to imbue a diamond with its brilliance, fire, and scintillation. Each VanBrock diamond is precisely cut to achieve the maximum beauty for that stone’s inherent qualities. 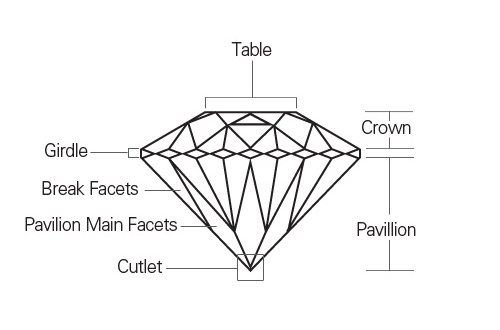 We select diamonds with perfectly angled facets and expertly balanced tables, crowns, pavilions, girdles, and culets. To ensure that you receive a diamond of unparalleled beauty and value, we adhere to strict gemological standards at VanBrock. There are specific requirements for each diamond shape, be it Round, Princess, Royal Asscher®, Radiant, Cushion, Emerald, Marquise, Oval, Pear, or Heart. We accept diamonds rated from good to excellent, and will gladly assist you in the selection of a symmetrical, well-shaped diamond. A diamond’s color is determined by minute impurities within the stone. The fewer the impurities, the greater the value. The diamond color scale starts at D (colorless) and extends all the way to Z (light yellow). However, at VanBrock we only accept diamonds rated from D through I. We believe our clientele deserve the best: colorless or near-colorless stones. Each diamond is examined at 10x magnification and assigned a grade based on its clarity. This enables you to compare one diamond to another. At VanBrock, we only accept natural and untreated diamonds. We reject diamonds that have been enhanced with heat treatment, color adjustment, or fracture filling. We generally do not accept visible black inclusions, or those reaching the surface of the stone that can compromise durability. Because carat weight is an important factor in pricing, you want to ensure that your diamond’s weight is consistent with its face-up appearance. Size is not everything when it comes to diamonds; proportion is vital. Some unethical diamond cutters fashion an excessively thick girdle or deep pavilion in an effort to increase a stone’s weight. Some also try to create the illusion of a larger stone by cutting a shallow pavilion. Each of these false effects impairs the beauty and value of the diamond. At VanBrock, we fully inspect each diamond when it arrives at our gallery and again at the time of sale to ensure that it meets our rigorous standards. While each factor is important, we believe that cut, color, clarity, weight, and proportion all contribute to the overall beauty and unique personality of your diamond. Fortunately for us, the modern-day method of creating cultured pearls guarantees that pearl necklaces, bracelets, and earrings are no longer limited to royal jewelry boxes. Today, we can all wear smooth, lustrous, real pearls just like our style icons CoCo Chanel, Jacqueline Kennedy, and Audrey Hepburn. Pearls are formed inside a mollusk or oyster. When a foreign body from the surrounding water gets inside its shell, the mollusk coats the irritant with layers of nacre. It can take years for one perfect pearl to develop. Natural pearls are created without any assistance from humans. However, there are very few naturally occurring pearls left in the world today. To cultivate a pearl, human intervention is required. A pearl technician performs the seeding operation. A shell bead and a small piece of mantle tissue are inserted into the host mollusk. After years of careful nurturing, the gem is harvested from the mollusk and added to a beautiful strand of matching pearls. Today, there are saltwater and freshwater pearl farms throughout the world. The diving, seeding, cleaning, and harvesting of cultured pearls requires many hours of labor at great expense. We think you will recognize the quality and value in the exquisite pearl jewelry at VanBrock. Akoya Pearls are produced by farming the small Pinctada Fucata oyster in saltwater near Japan and China. After an Akoya oyster is seeded, a pearl can usually be harvested in 9 – 16 months. The small and lustrous cream or white pearl is the one you see most often. Tahitian Pearls are cultivated primarily around the islands of French Polynesia. They are often called Black South Sea pearls because they derive from the black-lip oyster. They range in color from black to white. South Sea Pearls are cultivated in saltwater near Australia, Indonesia, and the Philippines. The South Sea Pinctada Maxima is a rare pearl oyster that produces the largest pearls, the finest nacre and prized mother-of-pearl. The Pinctada Maxima oyster can grow as large as 12 inches in diameter. South Sea pearls are often white, creamy, or golden in color. Freshwater Pearls are farmed and created using freshwater mussels in lakes, rivers, and ponds in China and the United States. These cultured pearls are available in a wide range of sizes, shapes, and colors. While there is no standardized grading system for pearls, VanBrock has developed a reliable technique for judging the quality and value of a pearl based on luster, shape, surface appearance, size, color, and uniformity. Hardness: Quality pearls score from 2.5 to 3.0 on the MOHS hardness scale. Luster: The quality of the nacre determines the intensity of the light reflected from a pearl, which in turn determines its beauty and value. Surface: The surface of each pearl should be smooth and free of irregularities such as pitting. Size: The larger the pearl, the more rare it is. Color: Pearls come in a wide variety of naturally occurring colors. There are two aspects of color to consider: the body color and overtone. Body color is the dominant shade which may be white, black, gray, yellow, orange, pink, lavender, green, or blue. Overtone is the translucent surface color, which may include pink (called rose), green, purple, or blue. Uniformity: All pearls on a strand should be consistent in size, shape, and color. A graduated string of pearls should increase uniformly from the ends of the strand to the center. 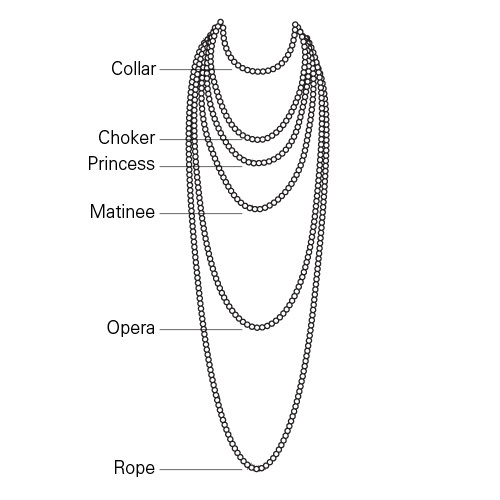 Length: Pearl strands are typically offered in six lengths, as shown below. Just for Fun: Many cultures consider pearls an important part of their traditions. You may have heard of the sacred Nine Pearls of Hindu mythology, or the “pearly gates” of heaven described in the New Testament. Pearl is the birthstone for June and the gem of the third wedding anniversary. The colorless mineral corundum holds many surprises. When trace elements interact with corundum’s crystal structure, the world-renowned ruby may be created. Or a deep blue sapphire may form. Or one of several rainbow colors called fancy sapphires may develop. But that’s just the beginning. Corundum can also produce parti-colored sapphires that combine more than one color. It can yield star rubies that possess a naturally occurring six-ray star pattern. It can even create color-change sapphires that do just that. Of course, the corundum is more than just a pretty face. Its visual assets are backed by impressive strength. Corundum registers 9 out of 10 on the MOHS hardness scale. In fact, only the diamond is harder. This extreme durability makes ruby and sapphire jewelry ideal for everyday wear. A ruby’s color is determined by the amount of chromium present in corundum. The most prized ruby exhibits a deep, vivid red, or purple-red color. Due to its vibrant hue, the ruby is deemed more valuable than any other member of the corundum family. In fact, the ruby is usually considered more valuable than any other colored gemstone in the world. Historically speaking, the ruby has a rich and colorful identity. Its name derives from the Latin word “ruber,” which means red. Rubies have been worn by warriors for protection and by royalty for power. The lush, red ruby is often associated with passion, love, wealth, warmth, blood, and fire. Rubies are definitely red-hot among jewelry connoisseurs. Hardness: On the MOHS hardness scale, ruby rates 9.0. Just for Fun: Ruby is the birthstone for July and the gem of the 15th wedding anniversary. Padparadscha sapphire is a special variety of corundum featuring a delicate mixture of pink and orange that some say resembles a sunset, a lotus flower or a combination of the two. Its unique name comes from the Singhalese term for “lotus blossom.” The exotic salmon color of padparadscha blends the richness of a ruby with the brilliance of a yellow sapphire. Hardness: On the MOHS hardness scale, padparadscha rates 9.0. Just for Fun: Padparadscha sapphires have been prized throughout the ages and are extremely rare. They are considered one of the world’s most valuable gems, with prices similar to fine ruby or emerald. This popular variety of corundum achieves its blue color from traces of iron and titanium. Sapphires occur in vivid, pure, deep blues, plus every shade from green-blue to violet-blue. Sapphires have long been associated with royalty and romance. Throughout the course of history, this gem has been worn as a protective amulet, as a symbol of harmony, loyalty, and friendship, and as a romantic token. Hardness: On the MOHS hardness scale, sapphire rates 9.0. Just for Fun: Sapphire is the birthstone for September and the gemstone for the 5th wedding anniversary. It is sometimes chosen for an engagement or wedding ring. As if rubies and blue sapphires were not enough, the corundum also treats us to a myriad of other colors. Fancy sapphires can be found in virtually every color of the rainbow: violet, green, yellow, orange, pink, and purple, as well as gray, black, and brown. While many color variations exist within the fancy sapphire category, the supply is not abundant. In fact, some colors are extremely rare. Despite their scarcity, these beautiful and strong gems are very popular with today’s jewelry designers. Just for Fun: Sapphire is the birthstone for September and the gemstone for the 5th wedding anniversary. Neon blue-green. Bright pink. Electric blue. Watermelon. Exploring all the hues available in this popular gemstone will make you feel like a kid in a candy store. Tourmaline comes in more colors and combinations than any other gemstone in the world. Tourmaline comes from the Sinhalese word “toramali,” which means “mixed gems.” As the name indicates, tourmaline gemstones are not only available in a variety of vibrant hues such as pink or green; they also come in unique color combinations such as pink and green. A slice of parti-colored tourmaline is strikingly similar to a slice of ripe watermelon. Hardness: On the MOHS hardness scale, tourmaline rates 7 – 7.5. Just for Fun: Tourmaline is said to enhance artistic creativity. Tourmaline is an alternative birthstone for October and the gemstone for the 8th wedding anniversary. In its purest form, beryl is a strong, colorless mineral. When Mother Nature mixes in a few impurities, the resulting gemstone may be a radiant emerald, aquamarine, morganite, or heliodor. There’s even a rare, raspberry-red beryl gemstone from Utah that can be worth as much as $10,000 per carat. Most jewelry enthusiasts are familiar with the brilliant green gemstone known as the emerald. However, emeralds would not exist without the humble mineral beryl. In its original, colorless form, beryl is also referred to as goshenite. Let us introduce you to the many colorful gemstones that owe their beauty to beryl. When beryl is colored by trace amounts of chromium or vanadium, the result is the alluring and elegant green emerald. Emerald stones can range from bluish green, to pure green, to yellowish green. The most prized color is usually the bright, rich, grassy green. However, blue-green Colombian emeralds are also highly esteemed. Most emeralds have many inclusions that are visible to the eye. Because the inclusions often appear mossy and entwined, they are called “jardin” which is French for “garden”. While emeralds are durable, they require special care due to their many inclusions. Emeralds with no eye-visible inclusions are extremely rare. The very best emerald specimens can be worth more per carat than diamonds. Hardness: On the MOHS hardness scale, emerald rates 7.5 to 8. Just for Fun: For centuries, emeralds have been considered one of the most precious gemstones on Earth. They were prized by the Incas, Egyptian pharaohs, Indian Moguls, Spanish conquistadors, and the Ancient Greeks. Emerald is the birthstone for May and the gemstone for the 20th wedding anniversary. This close relative of the emerald achieves its pinkish shade when beryl is colored by traces of manganese. Morganite can range from a delicate pink, to rose, to peach, and even salmon. Unlike the emerald, a faceted morganite gem usually does not contain eye-visible inclusions. Its pale color is best showcased in a large gemstone. Hardness: On the MOHS hardness scale, morganite rates 7.5 to 8. Just for Fun: Morganite was named after the legendary American financier J.P. Morgan. In addition to collecting money, Morgan was also an avid collector of gems. His friend and renowned gemologist George Kunz chose the name in Morgan’s honor in 1910. The blue or turquoise variety of beryl is named aquamarine for its resemblance to the many colors of the sea. It is created when iron impurities form in beryl and can range in color from pastel green-blue to deep ocean blue. Aquamarine crystals can grow quite large and are often free from internal flaws. Hardness: On the MOHS hardness scale, aquamarine rates 7.5 to 8. Just for Fun: Aquamarine is considered calming, soothing, and cleansing. It has been associated with mermaids, sailors, and all who travel over water. Aquamarine is the birthstone for March and the gemstone for the 19th wedding anniversary. While the emerald is certainly considered the most famous member of the beryl family, red beryl is undoubtedly the most rare. Discovered as recently as 1905, this unique gemstone includes many trace minerals that are not present in other beryl crystals including manganese ions, iron, chromium, and calcium. Red beryl emits a rich, raspberry hue, which may have formed from a high-temperature gas or vapor released during the latter stages of cooling and crystallization of rhyolite magma. Hardness: On the MOHS hardness scale, red beryl rates 7.5 to 8. Just for Fun: One red beryl crystal is found for every 150,000 diamonds and can fetch tens of thousands of dollars per carat. Very few cut specimens exist. Many people consider it the most rare stone on earth. In addition to the highest quality gold, silver, and platinum, VanBrock is proud to present a unique jewelry collection comprised of contemporary metals including titanium. Imagine a sleek ring made from the same durable material used in the medical field, aerospace components, and the marine industry. In chemistry, the term “noble” refers to a metal that resists oxidation and corrosion in moist air. Gold, silver, and platinum are all considered noble metals. They are ideal for use in fine jewelry because they are strong and long lasting, yet malleable enough to be shaped into rings, chains, and more. At VanBrock, we have particular standards for the noble metals we offer our clientele. We prefer 18-karat gold for our jewelry because it gives you the best of both purity and strength. In its purest state (24-karat), gold is far too soft to withstand daily wear. It would also make many jewelry pieces cost-prohibitive. 18-karat gold is stamped with a quality mark of “750” ensuring that the piece is 75 percent gold with 25 percent alloy. Rose gold is an alloy made by combining gold and copper. The higher the copper content, the deeper the red color. With its subtle pink hue, rose gold has become a distinctive fashion trend among some of the most popular jewelry designers. At VanBrock, we carry an extensive selection of strong yet feminine designs coveted by style connoisseurs and jewelry aficionados. We demand that our silver pieces are 92.5 percent pure. You will see “925” stamped on the piece. For silver, the 7.5 percent alloy is usually copper. Silver is both affordable and beautiful. Unfortunately, silver also tarnishes easily and is less durable than gold or platinum. Because silver conducts heat better than any other metal, the jeweler must take special care during ring sizing and other procedures that involve a torch. Many consider platinum the ultimate metal for fine jewelry. It is more rare and more expensive than gold. Platinum is the preferred non-tarnishing, naturally grayish-white metal for setting diamonds. At VanBrock, we use only high-grade platinum for our jewelry. Look for the quality mark of “950” which indicates the platinum is 95 percent pure with 5 percent alloy (typically ruthenium or iridium). Platinum has an extremely high melting point, which makes it more expensive for jewelers to shape than gold. Other members of the platinum family that are used as alloys include iridium, palladium, ruthenium, and rhodium. Rhodium is frequently used as a plating material for white gold, platinum, and sterling silver. In addition to Noble Metals, we offer our clientele a unique collection of jewelry and accessory pieces comprised of materials that are new, or at least new to the jewelry industry. To become part of the VanBrock collection, these new metals must meet our high standards for style and our strict standards for quality. Titanium is a transition metal with low density, high strength, and a lustrous gray color. This unique metal is not only hypoallergenic; it is biocompatible. For many consumers who are sensitive to conventional jewelry materials, it may be the only metal they can wear. Titanium’s biocompatibility makes it the metal of choice for the medical industry. It is a component in the artificial heart, a variety of medical and dental implants, and has a broad variety of other applications. Black titanium is created by exposing a specialized titanium alloy to extreme heat. The resulting metal is as hard as ceramic with a rich, clean, and distinctive look that resists scratches. There is no external coating, plating, painting, or spraying. During each appointment at VanBrock, you have the opportunity to learn more about gems and metals than you ever thought possible. Our team has been trained to enlighten clientele about the distinctive attributes that set fine jewelry apart from the rest. As you explore the exquisite jewelry at VanBrock, we will help you understand the unique science and high art behind each stunning piece. If you’re eager to begin your education now, click on your favorite gemstone or read up on metals. Then bring any questions to your appointment at VanBrock!